Baba's full name is the Levantine Trading Company. The Levant is not a precise geographical region, but it allows Baba to take on their choice of Turkish, Syrian and Lebanese cooking, amongst others. They've picked the best Middle Eastern dishes to compile a menu that makes coming to a decision difficult, but promises that just about anything you do choose is going to be rewarding. The menu features hot and cold mezze, segues to some fine-sounding pides (goats cheese, beetroot, stinging nettle puree, and pickled turnip), gets serious with claypots (main dishes), then tempts diners even further with a fine range of desserts (including doughnuts with pistachios and thyme honey; and turkish delight gelato). Food safaris, varying in scope and price, give diners the option of letting the chef do the hard work of choosing as well as cooking. I could easily have filled out a meal with the hot mezze. Instead we chose two from that section, plus one main. 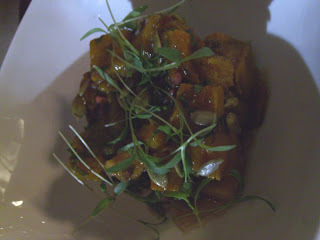 A warm, roasted pumpkin salad with chilli honey and croutons came as a rubik's cube of diced veg, dressed with greens and sunflower and pomegranate seeds. The soft, sweet pumpkin flesh is a natural match with honey, and the dish is balanced by the chilli heat, the sharp surprise from the occasional pomegranate seed, and crouton crunch. 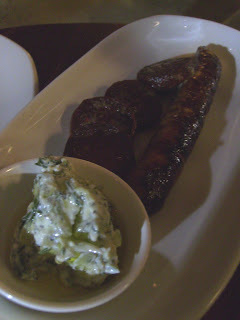 Merguez (spiced) and sucuk (dry) sausages are presented simply, with a lemon-tzatziki type dip. 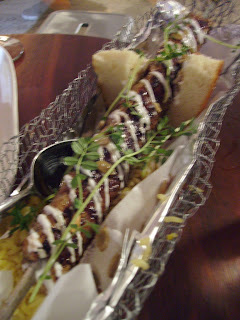 The main of wild rabbit kofte came skewered, served in a wire basket atop pilaf, drizzled with yoghurt and sunflower seeds. The meat was surprisingly robust and sufficiently moist to complement the dryish pilaf. We were impressed with the food's style and execution. With the fitout, however, they may have fallen into the trap that the menu avoids, of trying to do more things than they can aptly handle at once. There’s a DJ, spinning vinyl (a rapidly growing trend), who I think would be better placed over near the bar, rather than next to one of the restuarant tables. (The night we were there, a table of four older diners asked him in unsubtle terms to Turn The Music Down.) They have a very big space and are utilising it for both restaurant and bar areas. With a lot of overlap, that could get confusing if the option of stopping in for drinks and pide or mezze takes off. The decor is mainly browns and creams and while the northern wall features an effective mural, it is also primarily chocolate brown and cream, so doesn’t quite enliven the room enough. There’s an impression of trying to look settled in, when they’re actually brand new, but, in the case of the light fittings, for example, it comes across as looking a bit careless from the start, rather than chic. The service also has room for improvement. As all the restaurant tables were filled, we were sat at a small, low bar table, on stools, and weren’t offered the option the move as diners left. When our main dish arrived, the waitress commented the table was getting crowded, but made no offer to clear dishes or redistribute the remaining food. These are teething problems however, certainly not critical concept failures. The food is accompanied by an excellent wine list - no generic Fosters choices here. PX Romate Cardenal is available, and schooners of Mountain Goat are on tap for $6. Once they take delivery of boxes to fit, Baba plans to start offering their pides take away. 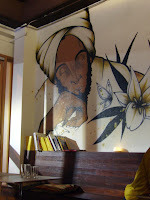 There are several irons in the fire, but having already established a good basis of clientele, there are promising signs for a few niggles to be smoothed out, making Baba a great option for a quick drink and nibble, or a long-winded Levantine feast. The food was great but I cant say the same for the service. It was my boyfriends birthday and there were 13 diners, i made a booking and asked if I could bring a cake, they said it was fine. On arrival they told us that there was a $5 cakage fee, this meant that we would of had to pay an extra $65 for using their cutlery! on top of our $600 bill! They also served outdated beer!! Go for the food but check the date on the beer! Thanks for your comment. That's a pretty unfortunate outcome! There seemed to be a few things like that, which Baba need to iron out to make the place a great venue. Their food is an excellent start, and hopefully word of mouth will get them working on the service! The taste of the food was great, but what's with the $14.00 turkish pizzas...that actually are no bigger (or thicker!) than half a piece of lebanese bread with a bit of topping on them! The reason that I came here was because I did not want that "other-side-of-the-river-nouveaux-cuisine-portion-thingamy-which-leaves-you-starving"! Sadly, there just wasn't enough, and unless there's a change in the serving sizes, I will not be rushing back! PS One of the waitresses looked like she had had a bad hair day, oops, month! The service is friendly but patchy, and the price of the food overall is cheap... cakeage is probably reasonable. Comments on the waitresses hair belong South of the river and should be left in the Rangy darlink..